What an incredibly, awesome day I had on October 17th!! My sister told me I had to be at work at a specific time but did not let me in on any other information. I arrived at work and when I walked in I was greeted by my sister and my friend/co-worker Lilian. They were both wearing Pink Shirts that said Team Lisa. Lilian began to tell me her story of how I inspired her with my strength and positive attitude. As she told me her story, I couldn’t help but to cry. They were tears of joy and happiness that I could be such an inspiration to a dear friend/co-worker. When I was first diagnosed with breast cancer; I immediately had an overwhelming feeling of wanting to help other women in my shoes in some way or another, whether cancer related or not. But anyone who is experiencing something in their lives that troubles them. However I could, I want to make a difference in people lives and help them anyway I can and here I was learning I had done exactly that. The tears of happiness, joy and compassion just ran down my face uncontrollably. They had an extra Team Lisa shirt they had just for me and I put on. They then proceeded to take me down to the shop floor where we stopped. I looked around at a couple other employees seeing them wearing their pink Team Lisa shirts and was of course wondering, “What’s going on” looking at my sister who was just beaming with a smile of pride. I then heard a page that all employees were to report to the gridley area. I was very confused what was about to happen next. But then the most amazing feeling happened as I watched 160 employees come walking from all different directions smiling proudly wearing Team Lisa shirts so happy to see, supporting me and spreading breast cancer awareness in my honor. WOW!!! The love that filled my heart, the happy tears that filled my eyes, and the joy that filled my entire body, completely unexplainable but unbelievable feeling. It was incredible to see so many friends/co-workers supporting me and so happy to see me. BUT it didn’t stop there, at the same time this was taking place at Peter Paul Electronics in New Britain, Connecticut it was also happening at Peter Paul Electric in Fajardo, Puerto Rico where another 60 friends/co-workers were celebrating Team Lisa day in my honor support me and spread breast cancer awareness. Hamilton Connections in Meriden and Hamden. 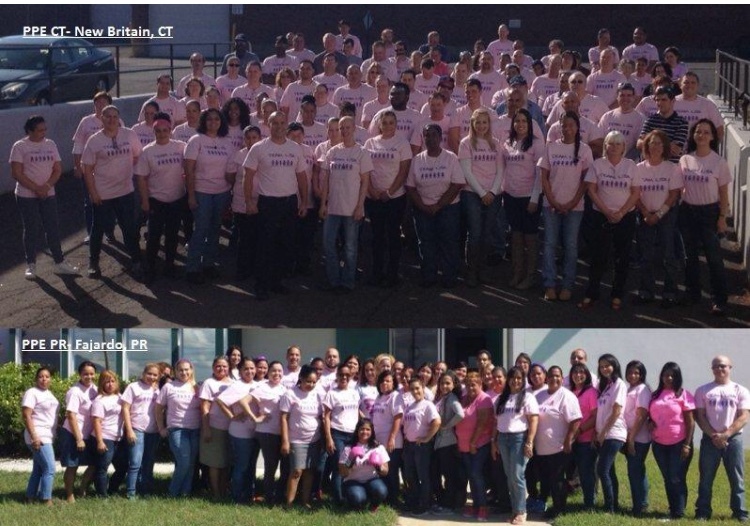 From Connecticut to Puerto Rico, over 200 people proudly wore TEAM LISA shirts showing their support for Breast Cancer Awareness and their fight to beat breast cancer for me. What an honor to have such a wonderful family supporting me, filling my heart with love and mind with strength. When I say family, I consider all involved my family. “Family isn’t always blood. They are the people in your life that want you in theirs. The ones who accept you for who you are. The ones who would do anything to see you smile, and love you no matter what.” I can’t thank everyone enough. A huge THANK YOU to EVERYONE. I Love you ALL!!!! It's because of you all that I stay STRONG FIGHTING HARD! XXOO. This was all coordinated by the people I work with. What an incredible group of people. What tremendous team work. They put this whole event together for me and I knew nothing. They all planned this together without anyone slipping the news to me. I am beaming with such a proud smile as I write this part of my journey. And it didn’t stop there, on the day of my surgery, November 5th, everyone proudly wore their Team Lisa shirts again keeping me in their thoughts and prayers all day. October 17th is by far one of the best days of my life. It’s a day I will never, ever forget and will talk about for the rest of my life. My heart is filled with so much love to know I am loved by so many.